Remember when you were a kid and asked why hamburgers are called hamburgers when there isn’t any ham in them? No? Was that just me then? Maybe we were showing our foodie leanings early on because the truth is that there are so many ways to make a great burger that have nothing at all to do with beef,let alone ham. A few years back, I set myself a challenge to come up with a non-beef burger recipe every Friday for a few months. It was a bunch of fun. I probably should do it again,in fact. 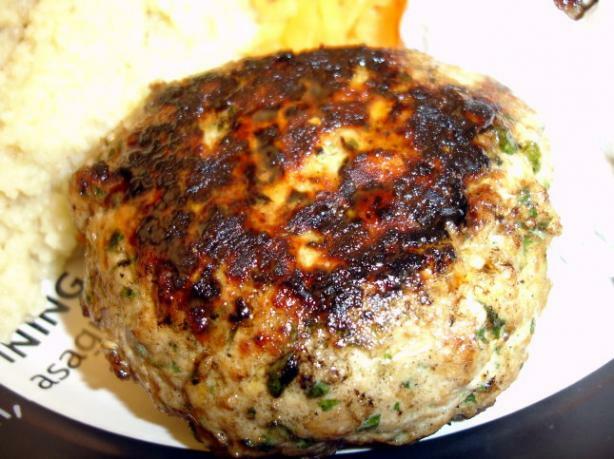 These herbed tuna burgers with wasabi were a result of one or those build a burger Friday nights. The only fresh fish based burgers I had made until that point were made of salmon. Part of me just wanted so see if fresh tuna would hold up to being made into a burger. Partially because tuna has a fairly delicate taste but also because of the crazy low fat content of the fish. The risk of having a tasteless,dried out tuna puck was high. It all turned out pretty well though, the soy sauce helped to maintain moisture and the herbs and wasabi worked overtime to assure flavor. Using wasabi paste also made it easy to control spice levels. Just add a bit more if you like things with more of a spicy bite or omit all together if you are making for kids or others with a more delicate spice tolerance levels. Put the onion, garlic, parsley, cilantro and soy sauce into a food processor or mini chopper and blitz together for about 20 to 30 seconds until everything is blended and the herbs are finely chopped. Empty the herb mixture into a mixing bowl and set aside. Put the tuna chunks into the food processor and blitz until the tuna is ground up but not yet a paste. This takes me about 30 seconds with the need to pulse a bit to get the stubborn chunks. Scrape the tuna out into the same mixing bowl you put the herb mixture into. Add the wasabi paste into the bowl and them combine with your hands to make sure everything is well mixed. Divide the mixture into four and make into four even sized patties. Put patties on a plate and chill in the fridge for 30 minutes. Take the burgers out of the fridge and heat a non-stick frying pan until it is hot and use either a bit of canola oil or a cooking spray if you want to save those extra fat grams. Though, if you keep it canola oil it is mostly unsaturated fat. So, whatever works for you. Put the burger patties in the hot pan and cook for about 5 minutes on each side until they are cooked through. This entry was posted in Home Cooking and tagged Burger, Fish. Bookmark the permalink.